and, in 1777, Antoine Lavoisier showed it was an element. with eight sulfurs per turn. thy aroma has abundant nose! thy bountiful goodness the whole earth knows! but what is it due to? I thy praises do extol. not just flavoring but food. and used it to cure a cough. also in Central Asia and Iran. 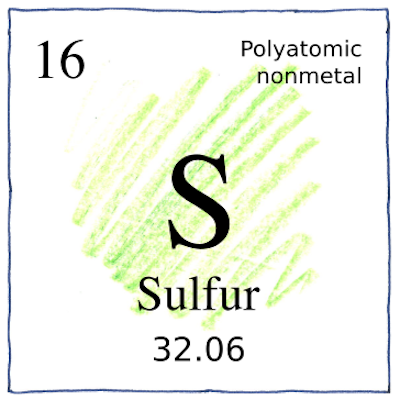 Common sulfur is pale yellow and composed of a mixture of elemental sulfur and rings, mainly rings of eight (a.k.a. octasulfur, cyclo-S8) but also rings of seven and six. Elemental sulfur is bright yellow. Sulfur burns with a blue flame and melted sulfur is red. S42+ is deep blue; S192+ is red. Compounds can be blue (lapis lazuli’s radical ion S3-) gold (iron pyrite FeS2), or vermilion (cinnabar’s mercuric sulfide, HgS). The active ingredient in garlic is 2-Propene-1-sulfinothioic acid S-2-propenyl ester, a.k.a. allicin.